Hervé Di Rosa is a French painter, co-founder of the Modest Art movement, and founder of the International Museum of Modest Arts (MIAM) in Sète. With only 20 years old, Hervé exhibits in Paris, Amsterdam and New York. In 1981, he co-founded the Free Figuration movement. Throughout his career he gradually diversified his artistic approaches by partnering with artisans from all over the world. This tour took him to Tunisia, Bulgaria, Ghana, Benin, Ethiopia, Vietnam, South Africa, Corsica, Cuba, Mexico, United States, Cameroon, Israel, and others. 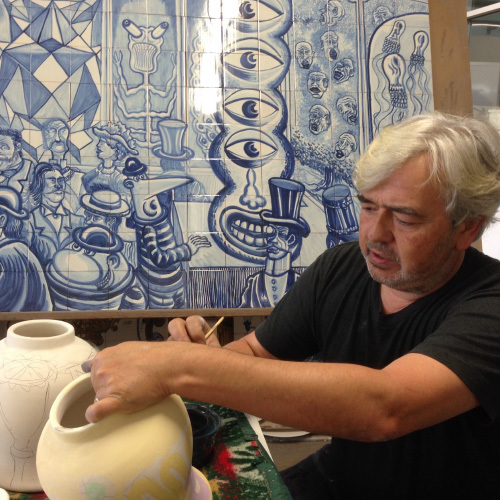 The 19th stage of this "return to the world of the arts" voyage takes place at Viúva Lamego, in Portugal, where he deepens his knowledge of the world of ceramics with the artisans of the factory.